Here is the completed piece a year later. Sorry it took so long. The picture is pretty bad, done with a cell phone as an afterthought. The eyes are gold leaf with black onyx pupils. The piece ended up being about 8 grams of .9999 fine silver. 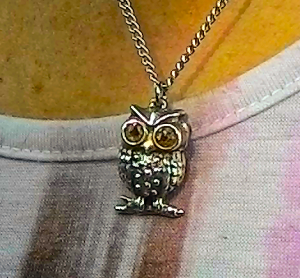 This owl became the property of my wife when she first set eyes on it. Just contact me if you want one! I’ll make you one for $85 which, is 1/3 the cost of a mass produced piece of the same size in a store or even ETSY. This takes me about 11 hours to make and yours will be unique like each of my works.